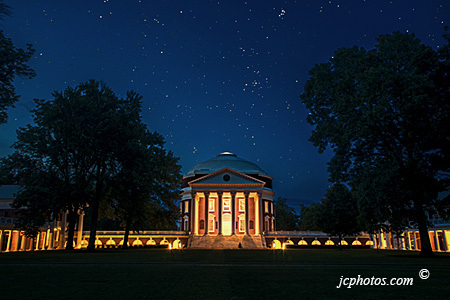 Jack Cacciatore photos highlight the beauty of the University of Virginia and surrounding area. These photographs accentuate the architectural accomplishments of Thomas Jefferson and this beautiful locale. As is demonstrated on these pages, the University of Virginia is one of the most beautiful campuses in the United States. The majesty and beauty of the Blue Rdge Mountains is vividly captured in the photographs on the pages of this web site. Experience the beauty of Blue Ridge Mountain sunsets, the Blue Ridge Parkway, Skyline Drive, the Shenandoah Valley, Albemarle County and the central Virginia foothills . The architectural wonder of Thomas Jeffersons Monticello is captured vividly in these photographs. Described by Jefferson as his "essay in architecture", it is surrounded by beautiful flower gardens, a large vegetable garden, & orchards, a great deal of which have been restored. All Photographs are for sale by phone or on this web site. on line or by phone . All Photographs in this gallery are available as art prints or as stock photography. All Photographs on this site are the copyrighted property of Jack Cacciatore. a violation of copyright law.